FILE - Robots work on the cab of a 2019 Ram pickup at the Fiat Chrysler Automobiles Sterling Heights Assembly Plant in Sterling Heights, Mich., Oct. 22, 2018. Manufacturing is one are where robots are part of the workforce. 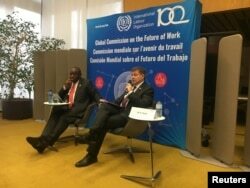 South African President Cyril Ramaphosa and International Labour Organization Director-General Guy Ryder launch the report of the Global Commission on the Future of Work at a news conference held at ILO headquarters in Geneva, Jan. 22, 2019. 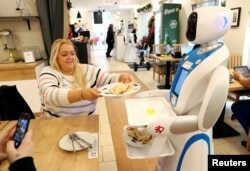 A robot waiter serves customers at a cafe in Budapest, Hungary, Jan. 24, 2019. How Do Workers Compete With Machines In the Near Future?